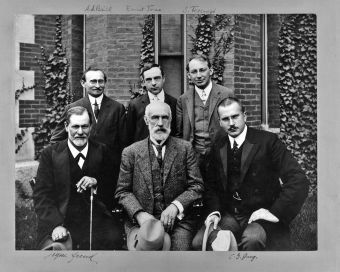 At Clark U. in 1909, from left (front): Sigmund Freud, G. Stanley Hall, Carl Jung; (back): Abraham A. Brill, Ernest Jones, and Sandor Ferenczi. The arrival of Sigmund Freud at Clark University would be an event that would shape both the community and the world. Sigmund Freud was only one of the major intellectual figures who was invited for Clark President G. Stanley Hall, himself a founder of the American Psychological Association, to speak at a series of lectures to commemorate the 20th anniversary of the university in 1909. Freud gave five lectures titled “The Origin and Development of Psychoanalysis” introducing psychoanalysis to the United States. Eventually these lectures would help create the International Psycho-Analytic Association and the American Psychoanalytic Association the next year. The trip helped create group analysis as Freud and other psychoanalysts spent their free time to America analyzing each other’s dreams. In 1999 his physical legacy was cemented when his statue was placed on Red Square. 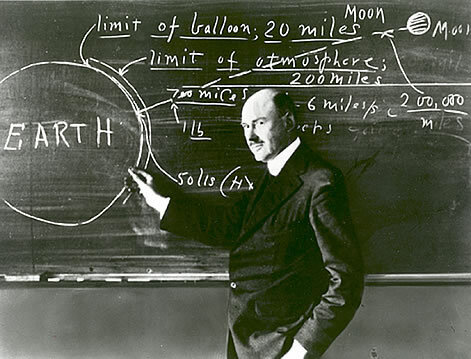 Doctor Robert Hutchings Goddard, the physicist who made rocketry possible, was born in October 1882 in Worcester. His fascination with rocketry emerged in full on October 19, 1899 when he climbed to the top of a cherry tree and in viewing the sky wondered about the possibility of ascending to Mars. He started by developing the various formulas to calculate the velocity of position in vertical flight. In the fall of 1914, He joined the staff of Clark University where he discovered the inefficiency of powder fuel for rockets as well as the fact that rockets would work in a vacuum. He then proved a liquid rocket was indeed feasible when on March 16, 1926 he fired his first liquid fueled rocket in Auburn Massachusetts. His work in rocketry would even be all but stolen by the Germans and put into the V-2 Rockets that would terrorize Britain, a weapon that could have been used by the U.S. if only they had been interested.